I’ve ordered my supplies from many different shops, websites, and even off Craigslist and Facebook. I love getting to support local businesses and online businesses, don’t get me wrong. I absolutely do so when I can! But I’m not going to lie, I like to save money, I like to get all my stuff at one place, and I like to get my bullet journal supplies fast. (Yes, I’m impatient!). I also love variety and getting to choose from many different options as opposed to only having one option to look at. So where is this all time, amazing, one stop shop where I can get all my bullet journal supplies? 90% of what you see here came from Amazon! Ok, I’m certain many of you have purchased at least a couple of bullet journal supplies on Amazon before. But there are reasons why 90% of the time Amazon is my one stop shop for all things bullet journal supplies. Amazon offers a ton of choices for bullet journal supplies, regardless of type of item. 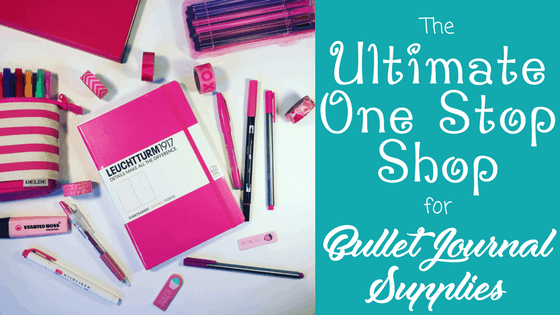 You can get majority of your bullet journal purchases from one site. Some retail stores will allow you to price match Amazon prices if it’s lower, so you can save money and get your products sooner! You can get your supplies very fast! Many different shipping options, not to mention including free shipping on many products! Amazon literally has hundreds of choices to choose from when it comes to bullet journal supplies. In fact, my favorite seven bullet journal tools that I absolutely have to use come from Amazon! Gorgeous bullet journal page by Alex shared on Instagram! If you hear of any bullet journal supplies from the various communities, it’s always worth a check to see if Amazon has it. EVEN if it seems like something that Amazon wouldn’t have! I found my favorite Japanese pens on Amazon. The reason why I consider Amazon to be a one stop shop is that you can literally get everything you need there alone. Don’t believe me? Below is a list of some of the most common bullet journal tools utilized in the community. Every single one of them you can get on Amazon. Love this mermaid themed spread by Claire from Instagram! This list showcases some of the most popular products mentioned in bullet journal communities. While I’m not able to list every single product out there, here are some of the most popular products out there. Leuchtturm1917 A5 Dotted Notebook heaven! 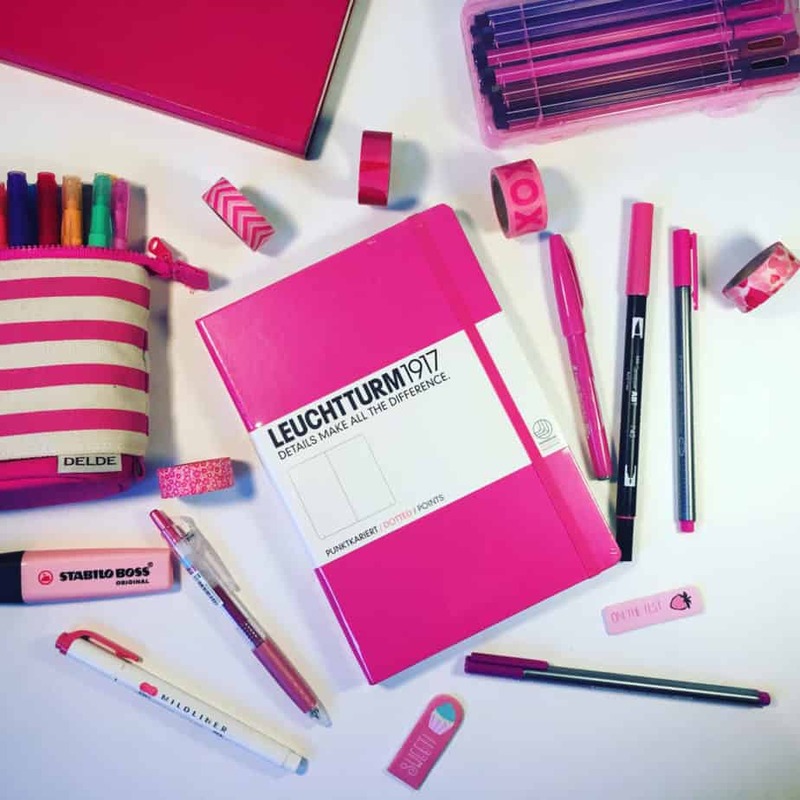 Leuchtturm1917– The Leuchtturm1917 Dotted A5 Notebook is one of the most popular choices for the bullet journal. So much so, that the owner of the bullet journal actually has an official bullet journal notebook created by Leuchtturm1917. I’ve written a review about them, too! Scribbles That Matter– The Scribbles that Matter Notebooks are newer on the bullet journal scene. However, they’ve proven to be very popular. They feature thicker paper, a pen loop, and pen testing page. Lemome– The Lemome Dotted Notebook is another variety rising in popularity. It also features a pen loop and thick pages. Moleskine– The Moleskine Dotted Notebook is another popular contender for bullet journal notebooks. One of the best things about the Moleskine is that some of their lined notebooks come in unique cover designs! Harry Potter Lined Moleskine Notebook, anybody? Staedtler– The Staedtler Triplus Fineliners are an excellent fine-tipped pen choice popular in the bullet journal community. The Staedtler brand is high quality and offers many different colors, Perfect for writing, doodling, and coloring. Tombow- Tombow actually has multiple choices that are loved by bullet journal fans everywhere, so here are your choices! Lovely tracker by Ashlyn shared on Instagram. Tombow Fudenosuke Pens– This amazing hard-tipped brush pen is a great choice for beginners who want to learn brush lettering. Not only will it help you create beautiful fonts in your bullet journal, but it will also help you learn how to brush letter. The hard tip makes it easier to control the pen, so I definitely recommend this pen if you want to learn how to letter. Tombow Dual Brush Pen Art Markers– These are my all time, favorite markers out there. They not only make for excellent brush lettering options, but they also feature a second (finer, harder) tip on the other end of the pen. So you can color, doodle, and brush letter. Since they are water based, there are a lot of other fun techniques you can play with. Kara at Boho Berry has a lot of super Tombow tutorials on her Youtube channel, like this one on how to a watercolor look with your dual brush pens. Tombow TwinTone Markers– This awesome Tombow product is much like it’s dual brush pen in that it offers two different tips on each pen. On one side, the pen features a broad bullet tip. The other side features a smaller, finer tip. Tombow Pencil– This pencil isn’t something talked about much on the communities, but I have to, these are perfect for doing rough drafts in your bullet journal. Super good quality, they write smoothly. Pair it with the high quality Tombow eraser and you can rough draft anything in your bujo! Tyi-Artline– The Tyi-Artline Brush Tip Marker Pens are great for beginner brush letterers (hard-tipped! ), but you get more color choices. While I don’t own these (yet), one of the things I love about these markers is that the body of the pen have grooves. I’m sure this is pleasing on a textural level, however, you can treat these pens like Legos! So they are easy to keep together, and you can also build the pens into fun little structures. Crayola– The Crayola Super Tip Markers are an option found in many households with children. They are great quality, and are a great price! But one thing I’ve learned recently is that you can create some awesome calligraphy with these markers! Sakura of America- The Sakura Pigma Micron Fineliners are popular in the community because the brand offers different sizes in pen tips. 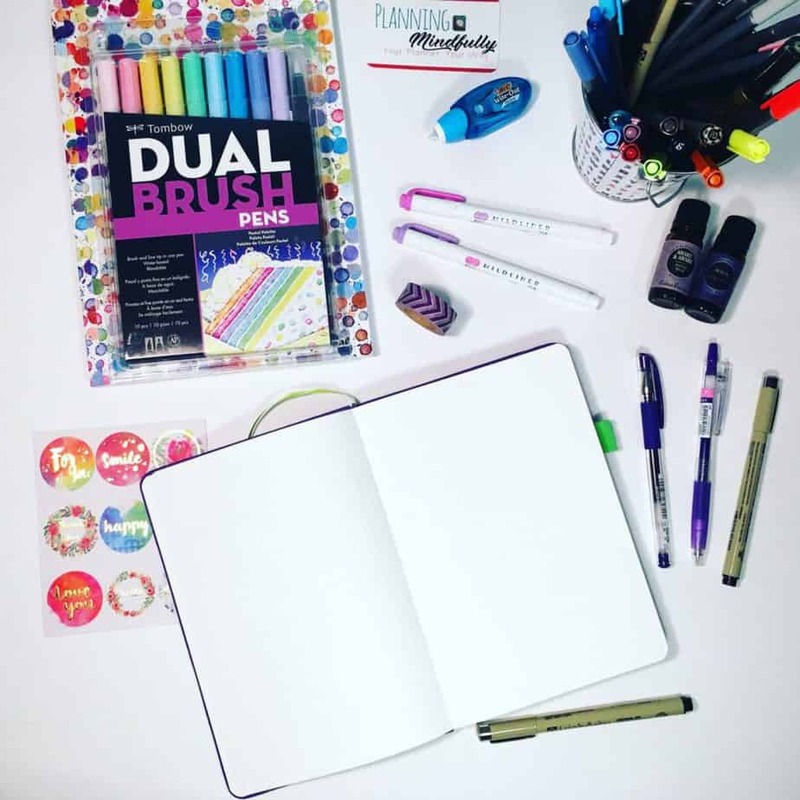 Prismacolor– The high quality Prismacolor colored pencils are amazing in a bullet journal. You get the look of markers (seriously, check out this Prismacolor tutorial on Youtube and be AMAZED at what they can do) without having to worry about bleeding. (Additionally, the Tombow eraser mentioned earlier works great with these!). Zebra- The Zebra Mildliners are another hot item that many people talk about in the bullet journal community. Like the Tombows, they offer two tips; one is a highlighter tip, and the other is more like a broad tipped marker. Perfect way to add a little pizazz to your drawings. Awesome washi tape collection from Bullet Journal Journey on Instagram. Since you really only need a writing tool and a notebook to have a bullet journal, thus the separate categories above. 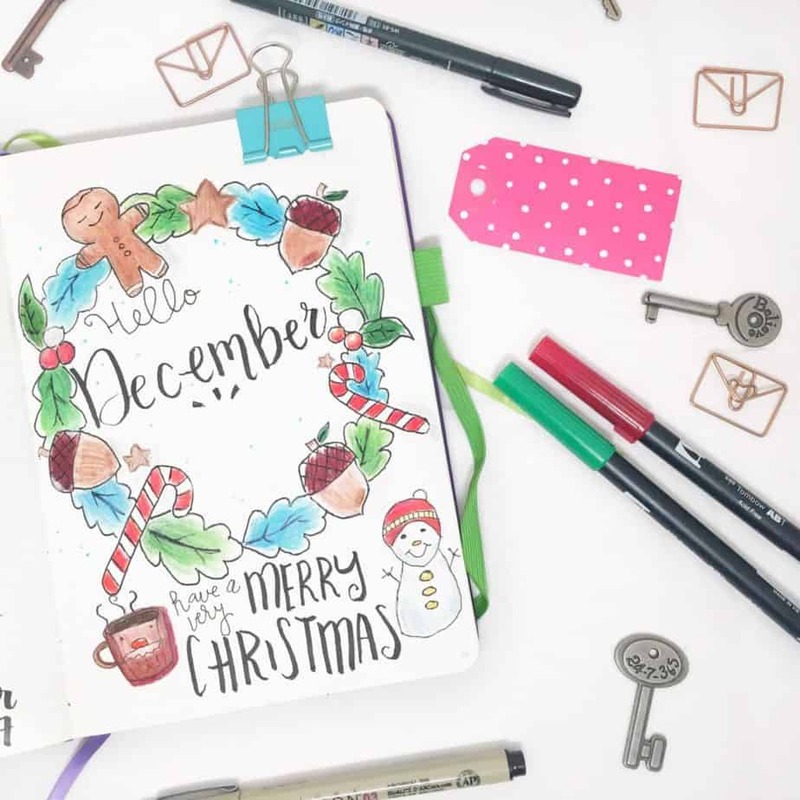 This section features other types of popular tools used in the bullet journal community. Rulers: A ruler is a must for straight lines. The best rulers are small and sturdy, like this thin 6 inch ruler from Westcott. White Out: This BIC Wite Out Correction Tape is a lovely option for easy fixes and no mess. I use it all the time when I make mistakes in my bullet journal. Carrying Cases: I love to bring my bullet journal and supplies anywhere, and the BUBM carrying bag is perfect! I can fit many pens and two bullet journals easily. Traveler’s Notebooks: Midori Traveler’s Notebook – While I currently do not use a Traveler’s Notebook system for my bullet journal, plenty of people do. Michelle from Seaweed Kisses offers an incredible instructional video on how she does her bullet journal in a Midori. Stencils: Many bullet journal users take advantage of stencils to help with drawing and lines. These 12 PVC stencils are easy to use, offer dozens of options to draw, and conveniently sized to fit in many of the A5 notebooks. (Unsure what A5 is? I discuss it in the Bullet Journal Glossary). Beautiful Christmas Wishlist shared by Elizabeth on Instagram. It’s hard being patient to get your bujo supplies!!! So this one doesn’t necessarily pertain to ordering my supplies from Amazon. However, it’s worth a mention, because it’s definitely saved me money from time to time. Picture this: You’re at a store, purchasing items that you need to get for the house. Your intention isn’t necessarily to purchase stuff for your bullet journal. But all of a sudden, out of the corner of your eye, you see the most amazing product that you’ve been itching to get for a while. You want to get it for your bullet journal. Then you look at the price tag. Groan. And there are no coupons, and no sales. Darn! Well, here’s another way that Amazon has saved the day with bullet journal supplies. (And helped with sticker shock). You have a smartphone, right? I’m willing to bet that majority of you do. I’ll use the Amazon app on my iPhone to see Amazon has the product for a lower price. It’s not always guaranteed to succeed, but more often than not, I’ve found that Amazon has a slightly better deal. Then I’ll take the item up to customer service. I’ll show the customer service representative the product on Amazon. Customer service will often verify the prices on the store’s own devices on Amazon at this point. If they determine Amazon offers the lower price, the store will match the price of their item to match Amazon’s price. Price matching= getting products faster and cheaper. YES PLEASE! Not every store offers this. I’ve listed the most popular stores where people purchase bullet journal supplies, and have a list of which ones offer price matching capabilities. Again, this point is primarily for price matching Amazon product prices at physical retail store locations. Amazon does NOT offer price matching if another store has a lower price. **Please note that these stores may change their policies at any time; it is possible that a store that currently offers price matching (as of December 2017) will no longer in the future. Also, there are stores not listed that may or may not offer price matching with Amazon; it is your responsibility to determine if that is the case. Each store has unique policies on items they will price match; make sure to visit each store’s website to verify understanding of price matching conditions. Pretty bujo spread by Kath shared on Instagram! I want my bujo supplies asap, please! I never have to wait long for majority of my supplies that I order from Amazon. Both for bullet journal supplies and my regular supplies. Usually after I order it, it’s on my doorstep in two days. Sometimes even less! Not to mention, most of the time I don’t even have to pay extra to get my supplies so quickly. Now, if you aren’t one to purchase a lot of items on Amazon, you may not find the service as beneficial as I do. However, you are in luck, because today you can try out Amazon Prime free for 30 days! As well as getting your bullet journal supplies faster, you can enjoy the perks of getting other Amazon items faster as well! I’ve purchased toys, books, clothes, jewelry, personal care products, and even food; you’ll find many items in each category that offer ‘Prime’ services. Look at all the beautiful things you can create from your purchases! There’s more, too! While you are waiting on your bullet supplies to arrive to your home, take advantage of the other services Amazon Prime offers! Enjoy e-books, music and video streaming. (While my zip code currently doesn’t offer this service, some zip codes offer same day delivery or 2 hour delivery services with a Prime account. You can check eligibility here. Not every Prime eligible product offers this benefit if you live in an eligible area for same day/2 hour delivery). (Please note that you will need a valid credit card to try out Amazon Prime for 30 days. You will not be billed during the promotion period; however, if you do not choose to cancel the membership, you will be billed for the service. They offer annual memberships and monthly memberships; you will need to select the option you prefer when you sign up). Oh yeah, are you a college student? You get a longer free trial of Amazon Prime! (And should you choose to become a member, college students get a reduced rate! Win!). Though Amazon Prime perks aren’t always available for all of the items I purchase, frequently there are options for free shipping. Yes, it may take a few days longer to arrive on the doorstep, it’s always nice to find a deal and not have to pay extra for shipping. If you are an Amazon Prime member, you may also get rewards for choosing slower (yet also free) shipping options. If you aren’t in a rush to purchase your items, check to see if Amazon will provide you a benefit for receiving slower shipping. I’ve received credits for digital products and their Prime Pantry service. Gorgeous monthly spread by Shayne on Instagram! If you live outside of the United States, you may not find that you are eligible for many of the services discussed in this blog post. Again, it doesn’t hurt to check to see if you can take advantage of many of the same deals and promotions! But I’ve heard from friends outside the United States that shipping prices tend to be quite a bit higher. So, you can literally get everything you need for your bullet journal on Amazon. Great prices, along with the option to price match Amazon prices at multiple physical retail facilities. Excellent shipping options; they offer many free shipping options, not to mention fast shipping possibilities with Amazon Prime. You can get anything you could possibly need all in one place. Pretty neat, right? What are the most surprising bullet journal supplies you’ve come across on Amazon? 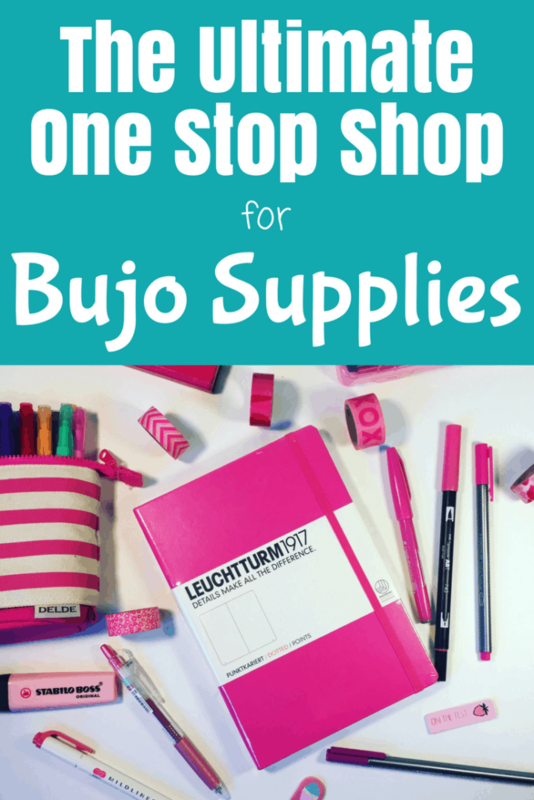 Have you gotten some awesome deals on your bujo tools? Tell me about your experience with buying bullet journal supplies on Amazon in the comments! Are there any other alternatives besides Amazon? I’d really like to get the supplies, but most of it isn’t shipped to my country. Completely understandable, and I’m exploring this!!! It’s a blog post that I’d like to write as I know many bullet journal artists do not reside in the US. Amazon is fantastic for bullet journal supplies, especially those good Japanese pens. They’re hard to come across (and for a good price) elsewhere!